As a kid, nothing’s more embarrassing than chickening out in front of your friends. One of my earliest memories of doing so was my first time jumping from a diving board into a swimming pool. Or rather, of walking slowly out on the plank, standing frozen in place for the most terrifying minute of my life, and crawling backward on hands-and-knees to the ladder. I was humiliated. More importantly, I had set a bad precedent for myself by bailing out when the going got tough. It wouldn’t be until well into adulthood that I’d finally face my “fear” of heights. Everyone gets scared sometimes. In life. At work. We’re afraid of being rejected, disappointing others, getting hurt, having cockroaches crawl in our ears (OK, maybe that one’s not universal . . . ), missing out on important things. In a word: We’re afraid of failing. 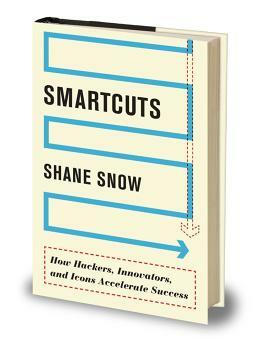 I dedicated a chapter of my book Smartcuts to the science of failure, and the balance that the world’s most successful people and companies manage to achieve between taking important risks and minimizing the odds of catastrophe. One thing that struck me from the academic research on the subject was how we humans tend to explain our successes and failures in ways that allow us to live with ourselves afterward. We distort reality–tell ourselves what we want to hear–and that gets in the way of our progress. In the case of Shane vs The Diving Board, I told myself that it wasn’t in my control: I simply “had a fear of heights.” I externalized the reason for my failure. It wasn’t my fault. It was the phobia. Yet–there was nothing inherently more dangerous about me jumping off the board than anyone else. I’d watched dozens of others jump: It was safe. In reality, I chose to indulge my fear. Sometimes we jump off that diving board and land in a bellyflop. But we live. I don’t have a clinical phobia of heights. As an adult, I’ve climbed to the top of skyscrapers and bridges. I’ve jumped from railroad trusses into rivers. I’ve been scared nearly every time, and that’s kept me from making stupid mistakes. I’ve managed to operate despite my fear. And I’ve done much scarier stuff in my life and as an entrepreneur without backing down. Every time, my confidence muscle gets stronger, and I get better at pushing myself to do important things in life–which, by definition, are hard or scary. Not long ago, I came across a Reddit post that articulates the tiny rule that’s helped me do this, to overcome the voice in my head that tells me to be scared, to walk on that stage or make that phone call or tell someone that thing they don’t want to hear. I count to five. This is a secret rule I have for myself. Whenever I don’t want to do something (something small like getting out of bed, to something bigger, like asking a girl out), I count to five in my head. Whenever I reach five, I have to do it. I have never failed to do what I set out to do once I hit five, so it always works for me, in a weird sort of way. I know that if I didn’t do it, the “rule of five” would cease to exist, and since I need it to exist, I have to do what I said I would do. It’s a weird paradox, but it works. In other words: If there’s something you know you need to do, just count to five, and then you must do it. And so you will. Sometimes we jump off that diving board and land in a bellyflop. But we live. In fact, after you flop a few times, you realize it’s not that terrible. But a sure way to fail is to not try at all. After fighting my internal naysayer all my life, I’ve realized I can’t change human nature, but I can redirect my fear of failure. What motivates me to jump on the count of five–now that I’ve committed to it–is the fact that I have to live with myself if I don’t.